A veteran cookbook author returns to her delicious culinary heritage in this savoury and passionate recipe collection. Victoria Jenanyan Wise grew up with the flavours, scents and seasonings of Armenian cooking - a cuisine that combines Mediterranean tastes with Persian, Arabic and Russian accents. In her first Armenian cookbook, Wise presents traditional favourites and inspired contemporary variations. The author takes us on a comprehensive tour of the typical Armenian pantry, with its nuts, seeds, herbs, spices, fragrant extracts and wealth of fresh ingredients. Each chapter begins with advice and commentary on essentials, such as fresh yogurt, starters (maza), breads, salads, pilafs, meatballs and other meat, fish and vegetable dishes as well as sweets. There is also a chapter on the Armenian people and its homeland. - Baklava and other fillo-pastry sweets; lemon yogurt cake, yogurt panna cotta with cherry sauce; almond and rice-flour pudding with toasted almond slices. 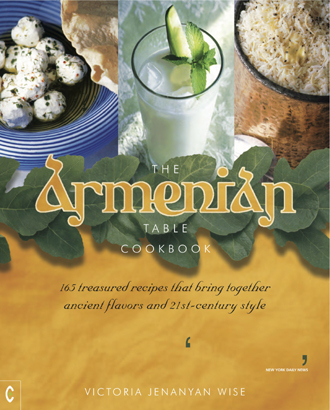 This authentic and warm-hearted cookbook will be met by a ready audience of Armenians, as well as lovers of Greek, Turkish, Mediterranean and Middle Eastern cuisines, and other culinary adventurers. VICTORIA JENANYAN WISE is the author of fourteen cookbooks, including the bestselling The Well-Filled Tortilla (co-authored with Susanna Hoffman), The Gardeners’ Community Cookbook, The Pressure Cooker Gourmet and, most recently, Bold: A Cookbook of Big Flavors. She lives in Oakland, California, with her husband, the cinematographer Rick Wise, who shot the food photographs for the cover of this book. Her website is www.wisekitchen.com.